The Reserve Bank of India is the central bank of India, acts as a regulator of the financial system. 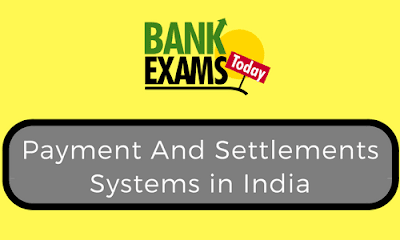 In India, Payment and Settlement are regulated by ‘’The Payment and Settlement Systems Act, 2007’’ Which provides the authority to RBI for all payment and settlement related matters. This act also provides the legal basis for ‘netting’ and ‘settlement finality’. Under this act two regulations have been made by RBI, One is, Board for Regulation and Supervision of Payment and Settlement Systems (BPSS) 2008.This committee is formed by the central board of directors of RBI. It deals with exercising its powers, the constitution of subcommittees and advisory committees for payment and settlement related matters. Another one is Payment and Settlement Systems Regulations, 2008. It deals the issues like the form of application for authorization for commencing on a payment system and grant of authorization, payment systems, furnishing of returns, documents, the furnishing of accounts and balance sheets by systems provider etc. It is an agency which will extend guaranteed settlement for trades done or reported on NDS in government securities including Treasury Bills. This is used to remove the effect of credit risk faced by the members who buy securities and sell securities. CCIL provides the additional comfort of improved risk management practices through daily marking to market of collateral, maintenance of daily margins by members and through a guarantee fund. Settlement through CCIL will be done on Delivery Versus Payment II (DVP II) mechanism. It refers to the settlement of securities on the gross basis while funds will settle on the net basis. It facilitates, funds can be transferred electronically from any bank branch to another having an account with any other bank branch in the country. It operates in hourly batches that mean funds transferred in hourly batches – there is eleven settlement from 9 am to 7 pm on week days and five settlements from 9 am to 1 pm on Saturdays. There is no minimum or maximum on a number of funds that could be transferred using NEFT. IFSC –Indian financial system code is an alphanumeric code that uniquely identifies a bank-branch participating in the NEFT system to route the messages to the destination bank or branch. 11 digit codes with first 4 alpha characters representing the bank and the last 6 numeric characters represent the branch.The 5th character is 0. It facilitates fund transfer from one bank to another on real time and on the gross basis. Without bunching with any other transactions, this fund transfer facilitates one to one basis without any waiting period. This is the fastest possible money transfer system and this system is meant for large value transactions. The minimum amount to be remitted through RTGS is 2 lakh. There is no upper limit for RTGS transactions. Fund transactions available from 9.00 hours to 16.30 hours on weekdays and from 9.00 hours to 13.30 hours on Saturdays for settlement. By this money can transfer from account to account of any bank branch to any other bank branch in places where EFT services are offered. EFT system presently covers all the branches of the public sector banks and scheduled commercial banks. To facilitate faster clearing of large value cheques (of the value of rupees one lakh and above) RBI introduce HVC, covering selective branches of banks for same day settlement. It is a Cheque clearing system. Clearinghouse sends the electronic image of the cheque and related information to the paying branch to eliminate the flow of physical cheque. It speeds up the process of collection of cheques. It provides more secure transactions. Reduces the scope for clearing related frauds or loss of instruments in transit. Lowers the cost of collection of cheques. Removes the reconciliation related and logistics-related problems thus benefiting the system as the whole. This uses a series of electronic payment instructions for transfer of funds instead of paper instruments. ECS-Credit – This enables companies to pay interest or dividend to a large number of beneficiaries by the direct credit of the amount to their bank accounts. ECS- Debit – This facilitates payment of charges to utility services such as loan instalments, electricity bill and payment of insurance premium, directly by debit to the customer’s account with a bank. It facilitates credits to bank accounts of multiple customers against a single debit of remitter’s account. NECS (Debit) - launched to facilitate multiple debts to destination account holders against a single credit to the sponsor bank. The system has a pan India characteristic leveraging on CBS of member banks, facilitates all CBS bank branches to participate in the system. The objective of this newly established company promoted by banks in India is to build robust and state of the art national level retail electronic payment system infrastructure in the country.